5 BR, 4 bath sleeps 15. Hot tub now available at $250. Perfect vacation place. This is a great large-family vacation rental. It is situated at 8,600 feet with a fantastic view. Elk, deer, bear, turkey, bobcat, squirrel, and various birds have been seen from the deck. Guests have used this home for reunions, weddings, and birthday parties. 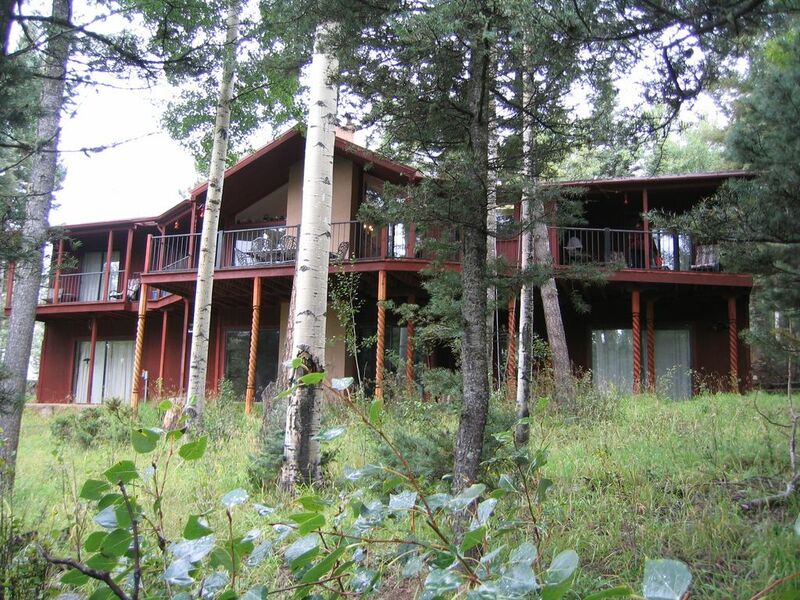 The vacation rental by owner home is 1.5 miles from the 67+ trails of the Angel Fire Ski Resort -- the only ski area in New Mexico that enjoys two high-speed quad-lifts. In the winter enjoy Angel Fire Resort’s Ski & Snowboard area covering more than 550 acres over 74 trails. The elevation at the summit is 10,677 with a vertical drop of 2,077 feet. The average annual snowfall is 210 inches at the summit. Twenty-six percent of the trails are for beginners (green), fifty percent of the trails are designated intermediate (blue), and twenty-four percent of the trails are expert levels (black). The ski area includes two Free Style parks. While in Angel Fire you can also enjoy night skiing and snowboarding, snowmobiling and a tubing hill. Located at the Angel Fire Country Club enjoy a full service Nordic Center with cross-country skiing, snowshoeing and a sledding hill. There are over 15kms of groomed trails for cross-country skiing or snowshoeing, lessons, equipment rental, retail and pull-sleds are available from the full-service winter sports shop. The Nordic trails are located right outside the back door of our house. Enjoy horseback rides, horse drawn sleigh rides, cowboy dinners and breakfasts. Wildlife and scenic photography are also a favorite. Be sure to visit on Christmas Eve & New Year's Eve when you will be treated to a torchlight parade down the front of the ski mountain followed by a brilliant firework display. If you are interested in indoor activities the Angel Fire Resort Country Club offers a modern fitness center with yoga room and an indoor swimming pool available for a nominal fee. At the Angel Fire Resort Country Club, experience fine dining in Elements, a fabulous mountain-view restaurant and winner of Wine Spectator’s prestigious 2013 Award of Excellence for its outstanding wine list. Or for something a little more casual you can visit the Par & Grill offering lighter fare. This 3500 square-foot house is ideal for the large or extended family. There are two family areas -- each with a HD Dish satellite TV/VCR/CD system. In addition, there is a DVD player available in the main living area along with a 52' TV. There are over 200 books, 40 VCR movies, 30 DVD movies, new bumper pool table, and a ping pong table with equipment. Amenities Galore: Amenities include a washer, dryer, iron, and ironing board. !! Now a modern computer/printer available with Hi-Speed Fiber optics up to 30mbps available, or bring your laptop and use the high speed wireless And available anywhere in the house and decks. Three bedrooms have a king bed. One bedroom has twin beds (double on the bottom and twin on top), and there's a dorm with three twin-size bunk beds. All sheets are furnished. Four full size baths come complete with all linens. Pets are not allowed, and there is no smoking. Prime times are during the ski season, but summers are a wonderful time to visit too! Fireplace and hot tub available. (Hot tub has a one time $250 fee for up to 7 nights). May be combined with our Bunker Hill House (property #211646) that is across the street. This permits accommodations for 30. Special rate for rental of both properties is a 10% discount for the lesser priced home. This property averages 5 stars on over 40 reviews. Large deck, great property for entertaining. Handicapped access on main level. Large 5 BR/4 bath home newly remodeled September/October 2013. Bed, bath and kitchen. 30 sets of bath linens available. High speed wired and wireless fiber optics up to 50 mbps speeds. Exercise bike and treadmill available. Large hand carved dining table. 2. Main one enlarged Oct 2013. South deck rebuilt July 2015. At extra charge of $250 for up to 7 nights. Located inside with sliding glass doors on 2 walls. Free hi-speed fiber optics Internet, both wired and wireless. New computer 2017 available. Now!! Optional hot tub available for $250 for visits up to 7 nights. We enjoyed our time very much. The house was clean and well kept. Perfect location and beautiful sunset. Very spacious! The owners were so kind! One of the best homes we have stayed in. Had a wonderful time with extended family. Huge home with three king bedrooms and an awesome bunk room for the kids. Ping pong table, two living areas, and an indoor hot tub make this an excellent mountain retreat. Easy access to the slopes. Thanks Roger for choosing the Bunker House for you recent ski trip. We are glad you enjoyed it and hope you will return. You are the type of guests a host loves to have. The great snows this year have made visits more pleasant. Please come back, we are always striving to make the home better. Our family came to Angel Fire for a skiing vacation. It included 17 family members from age 6 to age 70. The house was comfortable with plenty of room for all. We really enjoyed having ample firewood provided for the wonderful fireplace in the family room, and the cleared driveway with parking for 6 vehicles. We were only 1.5 miles from the ski lift and grocery shopping (which was great since it snowed quite a bit during our stay!). The house is located in a beautiful neighborhood with lots of trails, wildlife, and areas for the kids to play in the snow. The residential streets were very well maintained and cleared of snow. A great place for families of all ages. Thanks Sandy for the great words and 5 stars. We have always been pleased with the road plowing by the village and resort. They seem to respond well to storms. We always clean the driveway for arriving guests. Glad you enjoyed the free firewood, and the home for your large group. We try to offer our guests the best. Glad the animals from Central casting showed up as ordered. Please come back again and stay in one of our large homes. Very Spacious!!! Fit our family needs to a T. Relaxing time in the mountains!!!! Rod and Pat were a joy to work with. Would recommend this place and would return. Enjoyed sitting on the deck drinking coffee, watching the deer and hummingbirds, and the Grandsons. As kids grow up and become adults, and everyone has busy lifestyles, family time is hard to come by, little alone a family vacation. But we did it and had a wonderful time! This house was perfect for everyone. Plenty of space, view is awesome, and the wildlife in the area is great to watch. It’s close to area lakes and short drives to Red River & Taos. Thank you Rod and Pat for helping us make great memories! And thanks to Vickie, the property manager, for her and her husband’s help and advice when Hwy 64 closed do to a land slide! We appreciate Vonda and her group. With the fire in Cimarron making arrival into Angel Fire difficult, Vicki, our property manager assisted Vonda’s group with a safe routing. We strive to give our guests a great experience in spite of the circumstances, many of which are beyond our control. We look forward to welcoming this group back one of her homes. This house is perfect for a large group. With bedroom areas on both floors, two families can stay and have their own private living quarters. Our group enjoyed the ping pong table and the hot tub. The living areas are comfortable, and the kitchen is well-equipped. The house is close to several hiking trails. We had a great time enjoying the cool mountain air. I would definitely stay here again. We appreciate these fine words. This is a large home on a large lot that affords a lot of privacy both inside and out. We try to anticipate a guest’s needs and provide it thus giving everyone a memorable vacation. Craig, thanks to you and your group for staying with us. Please come back. The Angel Fire Ski Resort is located in the beautiful Sangre de Christo Mountains in Northern New Mexico. It is on the Southeast side of the Enchanted Circle. The valley is about 8600 feet with the ski lifts rising another 2600 feet. This Bunker House is located in the Angel Fire resort on the West side of the valley about 1.5 miles from the ski parking area.